My great-grandmother’s younger brother Arthur was the youngest child of Bernard and Frances Seligman, my great-great-grandparents, and the only one who was born in Santa Fe. He rose to the highest heights in New Mexico, elected twice to serve as the governor. His story is another remarkable one—the story of the son of a German Jewish immigrant who less than 80 years after his father first arrived in America was elected governor in a state with a very small Jewish population. There are many sources outlining Arthur’s life as well as many primary sources. I relied in part on Ralph Emerson Twitchell, Old Santa Fe: The Story of New Mexico’s Ancient Capital (Rio Grande Press 1925), pp. 477-478; the article on Arthur Seligman on the National Governor’s Association website; the article in The Dictionary of American Biography; and the vocesdesantafe website for much of the general background, but also used many primary sources such as newspaper articles, census reports, and school and city directories to fill in the details. Arthur was born on June 14, 1871. He grew up in Santa Fe and made several trips as a young child on the Santa Fe Trail back East with his mother to visit her family. He attended public school in Santa Fe, and then in 1885 he, along with his older sister Minnie and brother James, traveled across the country to Philadelphia where Arthur, Minnie, and James attended Swarthmore, as had their older sister Eva, my great-grandmother, before them. Arthur then attended Pierce Business College in Philadelphia. When he returned to Santa Fe after college, he worked as a clerk and then as a bookkeeper at his family’s business, Seligman Brothers. In 1896 when he was 25, he married Frankie E. Harris, usually referred to as Franc. She was four years his senior and a widow with an eight year old daughter named Richie Harris. Although they were married in Ohio where Franc had been living, they moved to Santa Fe after they married, and Richie took Arthur’s surname as her own. 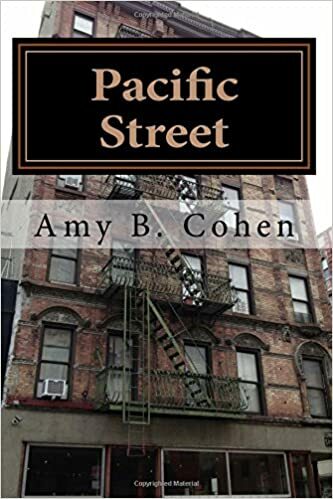 It’s not clear whether Arthur ever legally adopted Richie since she is identified as his step-daughter on the 1900 and 1910 census reports. I am curious as to how Arthur met Franc, but so far I have not been able to find an answer. 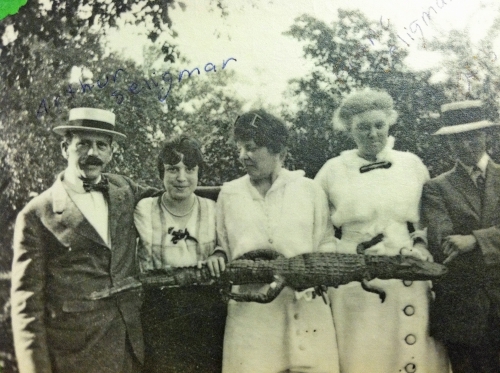 On February 14, 1898, Arthur and Franc’s son Otis Perry Seligman was born. On the 1900 census, Arthur listed his occupation as “merchant dry goods.” When the Seligman Brothers business incorporated in 1903, Arthur was named treasurer and secretary of the corporation with his older brother James serving as president and general manager. On the 1910 census, he still listed his occupation as a dry goods merchant. In 1900 Arthur was a candidate for county commissioner on the Democratic ticket. (“Personal Mention,” Santa Fe New Mexican (October 26, 1900), p. 4) He ended up defeating his Republican opponent in a close race where most Democrats on the ticket lost in the election. (“The Official Count,” Santa Fe New Mexican (November 13, 1900), p.4) In fact, the race was so close that his opponent challenged the results. 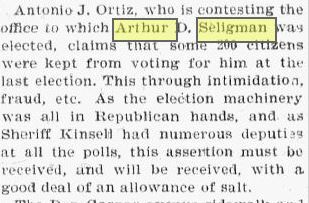 (“Election Contests,” Santa Fe New Mexican (December 13, 1900), p. 4) His opponent claimed that Arthur had used intimidation to discourage his opponent’s supporters from voting. Although I could not find a follow-up article regarding this challenge, I assume it was unsuccessful. Arthur served on the County Commission for many years and was soon its chairman. (“Arthur Seligman’s Work,” Albuquerque Journal (November 12, 1916), p. 6). The ad insinuated that Seligman had schemed to advance his own interests and that of the banks in the context of a bond issue to finance road improvements when he was serving as Road Commissioner. 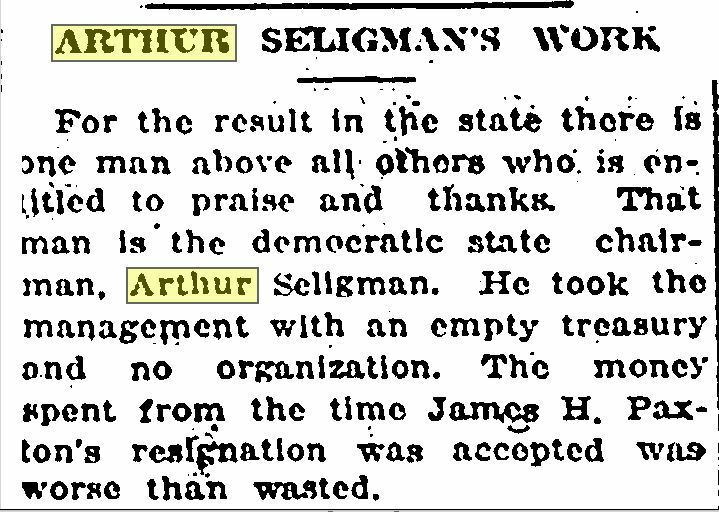 Although I cannot find any more about these claims and cannot even understand much of what the ad is alleging, it does not appear that this ad hurt Seligman himself or the Democratic candidates in the 1916 election. Despite his heavy involvement in political matters, Arthur still listed his occupation as a dry good merchant on the 1920 census. Franc’s daughter Richie, meanwhile, had married John Whittier March and had had a son George in 1919. Franc and Arthur’s son Otis was working as a bank clerk in 1920 and living with his parents in 1920. In June 1921 Otis married Doris Gardiner. Meanwhile, his business career was changing as well. 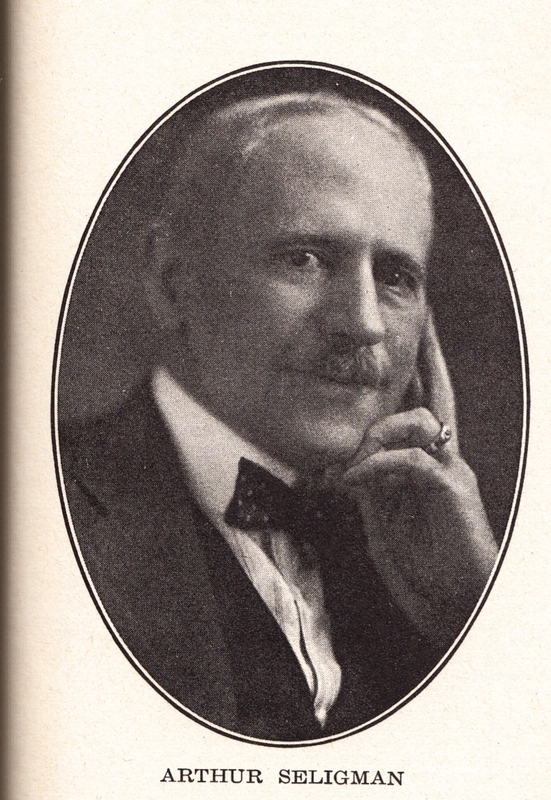 In 1925, he was not only running Seligman Brothers, he was also president of the First National Bank of Santa Fe. 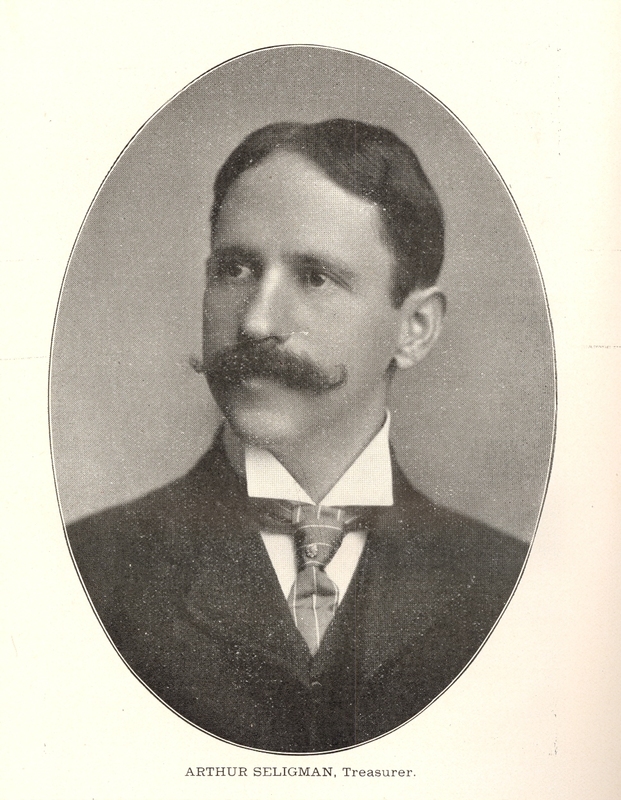 (“New Mexico State Items,” Estrella (June 20, 1925), p. 2) Ralph Emerson Twitchell wrote that Arthur had been vice-president of the bank since 1912 and became president in 1924. In the 1928 Santa Fe directory, he is listed only as president of the bank with someone named Evelyn Conway now running Seligman Brothers. By 1929, Arthur Seligman was already a very successful man both in politics and in business, but he was not done yet, and in 1930 when he was 59 years old, he achieved what would probably have been amazing to his parents, both of whom had died many years before—he was elected governor of New Mexico. This entry was posted in Miscellaneous information and updates, Santa Fe, Seligman/Seligmann and tagged Albuquerque Journal, Arthur Seligman, Democratic Party, New Mexico, politics, Ralph Emerson Twitchell, Santa Fe, Santa Fe New Mexican, Santa Fe Trail, seligman, Seligman Brothers by Amy. Bookmark the permalink. What an amazing story. It boggles my mind how seemingly easy people traveled with no super highways or airplanes. It is amazing—going back and forth by wagon, then eventually by train, later by car. In some later articles, there is mention of Arthur flying places and that he loved flying. Perhaps you and he could have been buddies!